The available Software was a preview version that doesn’t complies with the final product. As far as I saw, there were all expansion and game packs installed. All screenshots and names are from the German version. I did not have access to an English one. As for other expansions before I followed an invitation from EA Germany to the City Living event in Cologne and was able to get an impression of what we can expect with the new expansion pack. The event was taking place at the Unitymedia Medialofts. We were well taken care of and could enjoy some international food at the lunch buffet. We were able to play the game for about 6 hours after an approx. 20 min presentation by SimGuruGrant. 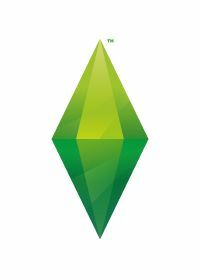 It was not possible to import any existing Sims or savegames so that we all started with a brand new game. Since the event was an hour longer this year and there was also dinner planned, most of us stayed for the night. The German community consist of a lot of awesome people and we enjoyed our time together. A big thank you to EA Germany for the great event. Only one of us conquered the big Pizzas we had for dinner. I couldn’t check out all aspects because of the limited time we had. There’s also a lot of info already out there because Maxis was showing off the content in official blogs and live Streams. I recommend watching the live stream from October 21st as it answers a lot of questions. The edit button lets you add the new lot traits. There’s also a new window when you choose an apartment to live in . There are no new options. The information button that used to be in the bar in the middle top now has it’s own place in the upper left part of the screen, since the lot traits need more room. If your in an apartment, you can’t change the lot type. Residential lots: Jungesellensuite, Nobelviertel Glashaus. Apartments can’t be saved to the library as the option is inactive. It is possible to save individual rooms though. Grant couldn’t answer my question about new cheats. Thanks to SimTimes I can give you an overview of what you can expect. San Myshuno is the name of the new city that we get with the expansion pack. It’s heavily influenced by Moroccan, Japanese and Indian culture and .. a really big city. Myshuno Meadows: Special venue with 64×64 lot. Each neighborhood also has a common area which can be access without loading screen (within the same neighborhood). You’ll find food stands, musicians and street performers in all of them. Foods stands aren’t always there and festivals can change the way the areas look (see below). Depending on the neighborhood you’ll also find other pre-made areas that feature bubble blowers, Basketball, graffiti spray areas that can be sprayed by your Sims and tourists which roam about the neighborhoods. Tourists can be spotted by the way they dress. There doesn’t’ seem to be any special tag or role. 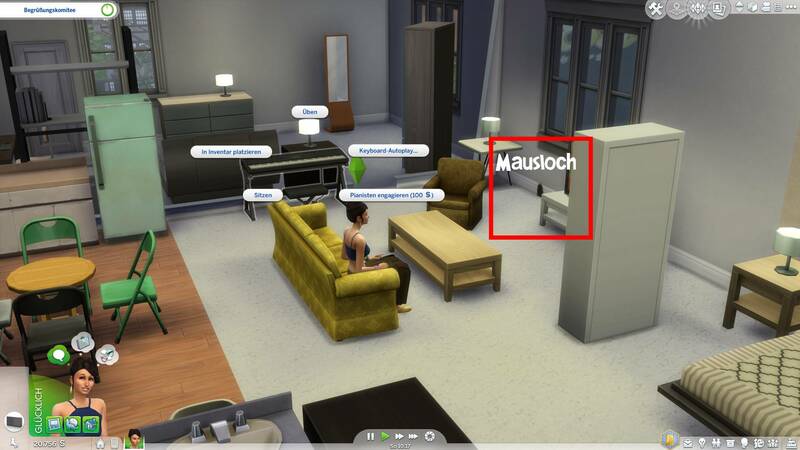 Your Sim has the possibility to study a map but that’s only an interaction. At the food stands you can try many different international dishes and you can learn how to eat with chopsticks or eat spicy food (hidden skills). If you’re not good at that, you’ll get negative moodlets and other consequences. Build mode brings a few changes. I’ve already talked about the GUI changes above. Next to that there’s a copy tool with which you can copy rooms, roofs and stairs. I didn’t check out the new things in buy mode, but the elevator is neither in BuyDebug nor in normal mode placeable unless you’re in a penthouse lot. I recommend the live stream and other sites for more information on this. 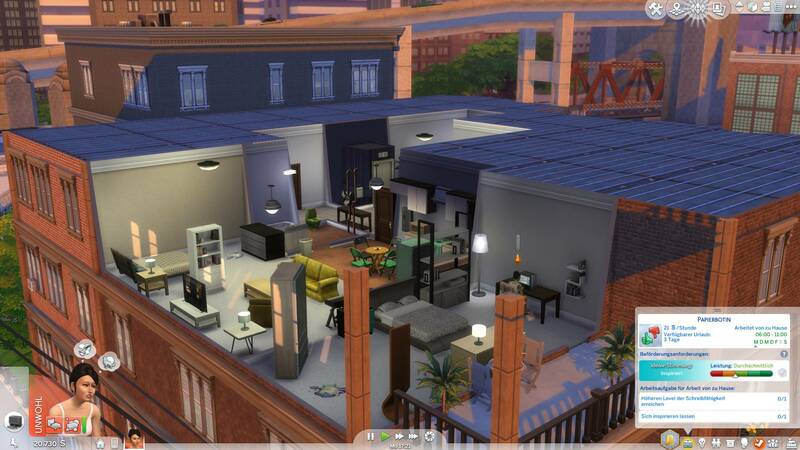 Apartments are one of the big features of this expansion pack. The buildings with the apartments are limited to San Myshuno and the outside form cannot be changed. Outside there’s a common area that is always visible and accessible without loading screen. You’ll find the trash chutes, mail boxes, a bulletin board and the elevator which teleports your Sims to the ground level. Unfortunately the elevator is not animated and actually just a deco item with some added functionality (spawning point). The common area is not editable. The following video shows how the loading screen and elevator teleportation works in detail. There’s only one apartment level per building but there are two-story apartments in Uptown. Like any good apartment building there’s of course neighbors that you can befriend or that get on your nerves. The more apartments are taken, the more active you’ll find the common area. They mostly walk by to take out their trash and check the mail though. If you are on good terms with your neighbors you can give them a key which allows them to pop into your apartment at any time. This feature is limited to NPCs. If you change to a neighbor you gave a key, they don’t actually own the key (Information by SimGuruGrant, I didn’t actually try this cause I wasn’t friends with my neighbor). I also do not believe that you can give the key to anyone living outside your building, since only neighbors from the same house come over. I haven’t seen any Sims from the street come into the building unless you invite them over of course (this is unconfirmed and just my impression) SimGuruDaniel confirmed to me that you can give keys to anyone. You can knock at your neighbors door to interact with them without having to enter their apartment and avoid a loading screen this way. You can talk at the door or ask the neighbor to come over to your apartment. Each apartment has an unchangeable trait and two others that you can set. Bugs and mice can be found in the cheaper apartments. Mouse holes actually seem to spread over time if you don’t take care of the problem but the animals are bound to an object around which they spawn. The mouse won’t run through the whole apartment or even go into the common area. Apartments are cheaper than your own house of course. The price consist of your rent and a deposit and you’ll also pay for furniture..
Penthouses are a bit different. There are a lot in staggering heights. You can put any lot on the roof (although they can’t have a basement): I didn’t check those out in detail. City living comes with 5 festival types, that always take place at a certain day. In which week they take place is random. Each festival comes with it’s own specialties that you can try. Ads for those can be found on the Bulletin-Board which give you information, what you can do and when it will take place. If you live in another neighborhood, you’ll still get a notification if one takes place and then you can travel there. Each festival has a booth where you can buy swag and other great things. Each festival has it’s own goodies. Fireworks, a special T-Shirt and a snow ball (new collectible) can be bought everywhere (different ones depending on the festival), but there’s also things that are special to the festival itself. Each festival has it’s own contest and special interactions. At the romantic festival you can talk to the Love Guru (rumor has it that he tell you your future) or you can spontaneously get married under the new wedding bow. GeekCon has many contest where you can proof your geekness, at the spice festival you can proof that no one can eat food that’s spicier than you and at the flea market you can buy collectibles for a good bargain or sell your own junk. 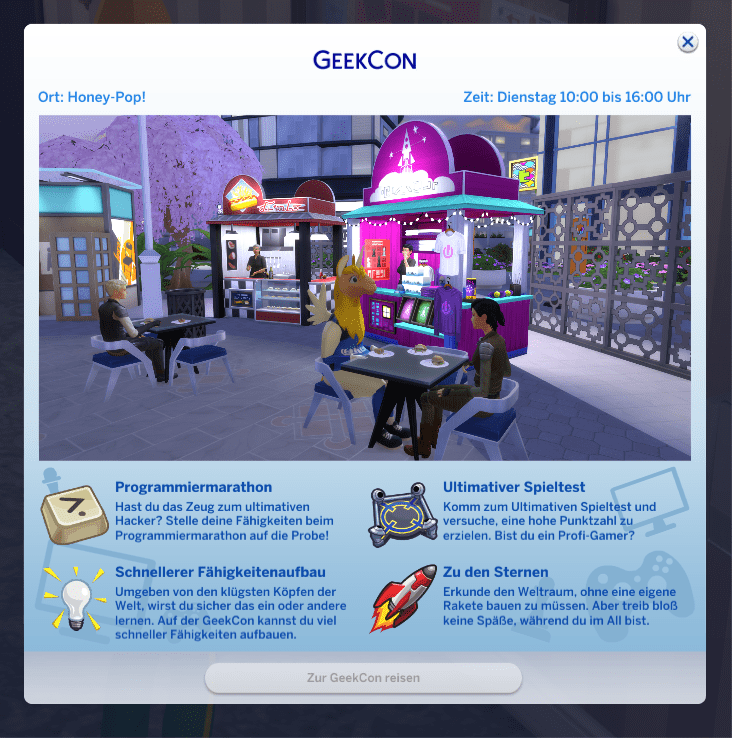 I was only able to try out GeekCon myself, since that was the only festival that spawned (unfortunately I had to start over at one point … ). I did watch some of the others though as others were playing. All three careers are a hybrid between the active get to work careers and the passive base game careers. They have a work from home option that gives you task you can do at home. My Sim was a critic (not a very successful one). I only had the tasks that are in the GUI (like increase writing skill and become inspired) but there’s also special task that pop-up from time to time. 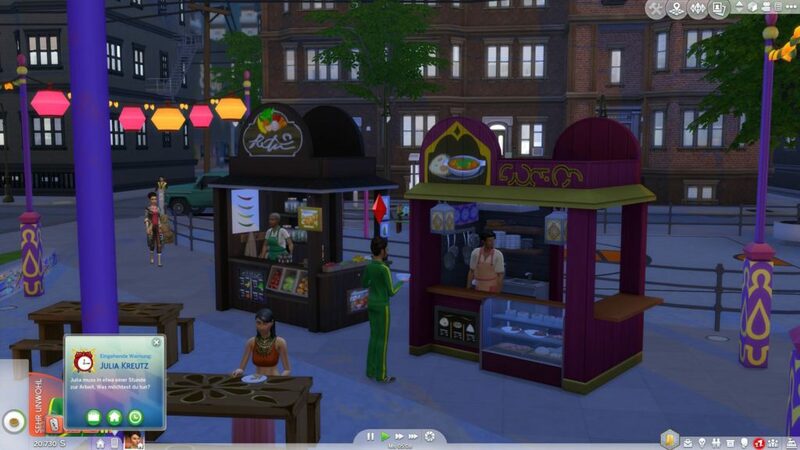 The new careers are available to all Sims even if they don’t live in San Myshuno but most of the task will need to be done in San Myshuno so that you need to travel there a lot. The career also have branches, that you can choose after a certain level. Apart from the big features, there’s also a lot of small ones. The new town is – like Windenburg before – very beautiful and full of little details. The city-feeling is definitely present und thanks to FX-Sims and cars (driving and parked) the town comes across as busy and not as empty as Windenburg. The team really did a great job on that. The idea of the different neighborhoods is really good but unfortunately they don’t really feel as different as I had hoped. The same NPCs can be found in all of them: The street performer, the musicians the food stands. They might differ from hood to hood but I would have wished for more variety. The tourist are really disappointing I would have wished for at least a tag or some special interaction (like they ask you for the way). All that distinguishes them is their funny clothing. Unfortunately I didn’t populate all apartments in my building and since I only use cheats to fix bugs, I didn’t think of upping the friendship to my neighbor. Because of this, living in an apartment didn’t feel that different from living in a house. I do hope that will change on more intensive playing. The festivals are nice but I do fear for the long time effect. There’s a lot to discover and I couldn’t try out most of them but do they have a replay value after you did it all ? I think it will be similar to the re-play effect of the Get to work careers. I still have hope for the new careers as I really liked the work from home feature. I didn’t have enough time to have a conclusive opinion on those. There’s a lot of little things that are fun but everything seems superficial. It’s dominated by moodlets. There’s so many new ones that my poor Sims didn’t know how to feel anymore. Another problem for me personally was the camera drift that is unfortunately there when you change to apartments. I did see worse on 3 level houses though. The content does justify an expansion pack, since there are a lot of aspects to it and the town alone probably has a huge development cost. There’s a lot of new objects and CAS assets and new features. Maybe less would have been more though. To me it seems like the devs take the difference between game pack and expansion pack they explained at the Gamescom literal. Expansion packs are widespread and game packs let them go into more depth for certain features. I would have gone for more depth and less wide. Apart from the not animated elevator, the Sushi is another disappointment to me. Why have that served on a plate ? I’ve never had Sushi on a plate unless in one of those conveyor belt ones. There’s a custom content out there that is so much more detailed. That’s how I wished it would look like. Everyone needs to decide for themselves if they want to spend the money. I definitely miss the really new gameplay.